Our research group comprises a national peptide, peptidomimetic and glycopeptide chemistry facility that occupies a world-class laboratory in the Institute for Innovation in Biotechnology. The peptide synthesis laboratory supports growth in the emerging area of peptide therapeutics that is growing at twice the rate of small molecule therapeutics. This is carried out by engaging with the local biotech community to develop viable drug candidates based on peptide leads. For example, NNZ-2566 (Neuren Pharmaceuticals) is currently in Phase IIb clinical trials for traumatic brain injury and was successful in phase II clinical trials for Rett Syndrome. WHO has given NNZ-2566 the name trofinetide. Our laboratory has also been licensed by medsafe for the GMP manufacture of peptides for the clinical trial of melanoma vaccines (MELVAC trial). The synthesis of natural product peptides utlising unnatural amino acids, depsipeptides, and cyclic peptides is one theme in our peptide chemistry laboratory. Analogues of the natural peptides are then synthesised to either simplify or stabilise the molecule with the aim of producing a more potent analogue. The ability to combine contemporary organic reactions such as cross-metathesis, “peptide stapling”, click chemistry, thiol-ene chemistry and the preparation of unnatural amino-acid building blocks with modern solid phase synthesis methods provides a powerful peptidomimetic platform to combat the problem of increasing resistance to existing antibiotics. The peptide chemistry group also synthesizes peptide-based hydrogels with applications in bionanotechnology and regenerative medicine. The following is a representative list of our research projects. Many of our research projects are not listed and we encourage you to contact us should you have further queries. Toll-like receptor 2 (TLR2) is a highly conserved membrane pattern recognition receptor that has evolved to recognize Lipoprotein motifs expressed by foreign pathogens. Upon binding of an agonist motif, the receptor is activated and the foreign agent is internalised, which modulates the production of signalling factors that up-regulate an effective immune response to that pathogen. It has been shown that activation of TLR2 can be attained with S-(2,3-bispalmitoyloxypropyl)Cysteine-based (Pam2-Cys and Pam-1-Cys) lipid motifs present in the cell wall of Gram-positive bacteria. Thus, by creating a construct in which this lipid is linked to a suitable peptide epitope, the TLR2 receptor can be recruited into producing a highly targeted immune response that can then be directed against cancerous cells within a host. The linker portion of the lipid-peptide construct epitope has conventionally been Ser-Lys-Lys-Lys-Lys but it is still not clear to what extent TLR2 activation is governed by this sequence. The project aims to investigate this question by exchanging the key Serine residue by other amino acids – both natural and unnatural – to gauge the effect on receptor activation and through this to better modulate the immunogenic response. The relative activity of the library of analogues thus generated will be evaluated in the HEK-blue™ cell assay. Multidrug antibiotic resistance poses an increasingly urgent threat to human health. Amongst antibiotic resistant species, Gram-negative bacteria in particular have become resistant to almost all available treatments. Whilst a number of antibiotics are currently being developed to target Gram-positive infections, only few are in progress for Gram-negative infections. Recently, a family of four cyclic tetrapeptides, namely pseudoxylallemycins A-D, isolated from the termite-associated fungus Pseudoxylaria sp. X802 were found to exhibit Gram-negative antimicrobial activity (MICs of 12.5-25.0 μg/mL), cytotoxicity (HeLa cells, CC50 10.3-49.5 μg/mL) and antiproliferative activity (HUVEC cells, GI50 4.3-33.8 μg/mL; K-562 cells, GI50 4.2-42.8 μg/mL). Pseudoxylallemycins B-D contain unique allene moieties (highlighted in blue), which rarely occur in natural products. 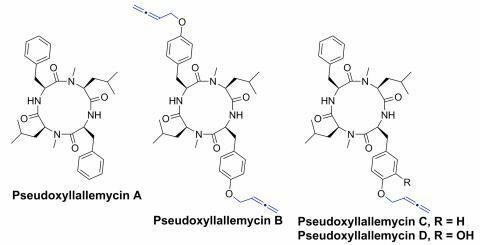 Using a combination of organic and peptide chemistry, this project aims to synthesise the natural products pseudoxylallemycins A-D and structurally related analogues, which will then be evaluated for antimicrobial activity in collaboration with Professor Greg Cook (Uni of Otago). Cone snails have evolved a venomous harpoon able to paralyse prey with an arsenal of toxic compounds, such as conotoxins, which show great promise in the treatment of conditions such as pain and neuromuscular disorders. κA-conotoxins are a major component of the venom of several species of fish-hunting cone snail, but as a class of compounds have been less well studied due to their molecular complexity and post-translational modifications. CcTx is a 30 residue glycopeptide that contains an intricate serine-linked pentasaccaride, 3 intramolecular disulphide bonds, several hydroxylated proline residues and a C-terminal alpha helix spanning residues 23Ser-27Thr. The unique pentasaccaride moiety, which contains several rare and unnatural L-sugars, probably plays a key role in its bioactivity. Using chemical synthesis techniques this project will embark on a total synthesis of CcTx using glycosylation and peptide chemistry to assemble from individual amino acids, the fully functional molecule. Candidates will become well versed in the modern methods of glycopeptide chemistry including exposure to advanced biophysical techniques such as HPLC and mass spectrometry. Leucinostatins are naturally occurring peptides which were isolated from Penicillium lilacinum almost 40 years ago. Twenty-four different structures have been described in the leucinostatin family, with leucinostatins A and B significantly suppressing prostate cancer growth in a coculture system in which prostate stromal cells stimulated the growth of DU-145 human prostate cancer cells through insulin-like growth factor-I. In order to execute the total synthesis of leucinostatins A and B, synthesis of the seven unnatural amino acid building blocks namely: (2S)-N’,N’-dimethylpropane-1,2-diamine (DMPD), (S)-N’-methylpropane-1,2-diamine (MPD), beta-hydroxyleucine (beta-HyLeu), 4-methyl-L-proline (MePro), (4S,2E)-4-methylhex-2-enoic acid (MeHA), (2S,4S,6S)-AHMOD and (2S,4S,6R)-AHMOD is required. Site-specific individual incorporation of a (2S,4S,6S)-AHMOD or (2S,4S,6R)-AHMOD residue into the peptide framework of leucinostatin is also required to determine the absolute configuration at C-6 in the AHMOD residue. Solid-phase peptide synthesis (SPPS) techniques will be used for peptide elongation to avoid tedious purification of the intermediates, thus expediting the assembly of the target nonapeptide. This research project aims to establish a comprehensive structure–activity relationship of leucinostatins A and B in order to search for analogues with improved anti-tumor properties. Antibiotic resistance has been recognised by the WHO as one of the greatest threats to humanity and infectious diseases rank as the second most common cause of death worldwide. This is further compounded by the observation that development of new structural classes of antibiotics has all but ceased in the past 40 years. An emerging subset of peptide based antibiotics e.g. daptomycin are cyclic peptides containing a lipid or fatty acid. They have been shown to be clinically relevant and are used as the “last line of defence” against otherwise untreatable bacterial infections. The challenge remains, however, to efficiently produce new antibiotics based on a cyclic peptide scaffold incorporating the crucial lipid motif. Using our newly devised method of installing a lipid onto a peptide (a thiol-ene reaction), this projects aims to exploit and develop this chemistry to generate a chemical library of peptide based antibiotics, which will undergo biological testing against the most antibiotic resistant strains of bacteria. The emergence and spread of multi-drug-resistant bacteria is becoming a great threat to the health of humankind. The rate of bacteria developing resistance to both frontline and ‘last line of defence’ antibiotics is currently greater than the introduction of new compounds into clinical practice. This poses a severe problem as simple routine medical procedures will become life threatening as any resulting bacterial infection will not be easily and effectively treated. Naturally-occurring antimicrobial peptides (AMPs) are the tools by which many living organisms employ to defend themselves against bacterial attack. These unique compounds therefore show great potential as new source of antibiotics. The ascidian metabolite and mannopeptimycin have been show to possess antimicrobial activity and contain the rare cyclic amino acid enduracididine (highlighted in blue). This project will involve two aspects of modern synthetic chemistry. Firstly, an organic synthesis of enduracididine and secondly, solid phase peptide chemistry to incorporate End into synthetic polypeptides. A successful synthesis of enduracididine will not only allow access to the above antimicrobial peptides and therefore the development of more potent analogues though SAR studies, but provide the basis for investigation of other peptides containing this intriguing amino acid e.g. teixobactin. Alzheimer’s disease (AD) is a complex neurodegenerative disorder that results in progressive cognitive impairment, loss of memory and changes in behaviour. In 2011, 34 million people worldwide were diagnosed with AD, and it is estimated that this figure will triple by 2050 due to an increasing ageing population. Despite vast research spanning more than a century, current treatments for AD are still limited to modest symptomatic relief and the precise causes of AD remain largely unknown. Recently, new evidence has suggested that beta-amyloid (A-beta) peptides (a hallmark of AD) that have been irreversibly modified by sugar derivatives known as advanced glycation end products (AGEs) are more pathogenic than A-beta itself. However, the A-beta-AGE peptides used in these studies were prepared by the non-specific incubation of A-beta in glucose; this results in the formation of a complex mixture of A-beta-AGE peptides. Thus, the precise impact of individual AGEs on the biophysical properties of A-beta remains to be evaluated. This project aims to prepare a small library of Aβ-AGE peptides, which will then undergo biological testing by Associate Professor Nigel Birch (SBS) and Professor Michael Dragunow (FMHS). Successful candidates will employ organic synthesis techniques to prepare AGE building blocks followed by incorporation of the AGE building blocks into the A-beta peptide using solid phase peptide synthesis.